Stefano Bittante: Pizza a Domicilio, let's begin! As promised, today I had to make Pizza a Domicilio available to the public. At the moment there are very few pizza shops, but I hope to resolve this problem as soon as possible. The structure is very basic, it's based on a plain home page where users are supposed to enter their address, and then, pressing the "Search" button they are redirected to a page displaying a Google Map of the area around the specified address. 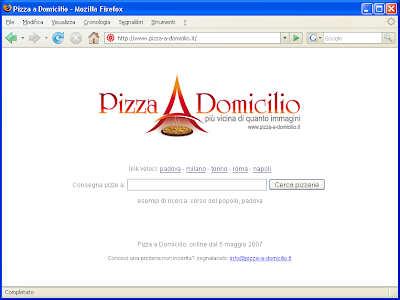 The destination url format is http://www.pizza-a-domicilio.it/map/?q=XXXX, where XXXX stands for the searched address. The geocoding is then performed thanks to Google Maps API, since any other way of doing it would have less efficient. This requires contacting a google server for any search performed by the user and this could possibly make the whole website experience much slower. This is why every search is cached, for a faster retrieval, into the same local database providing the pizza shop details. 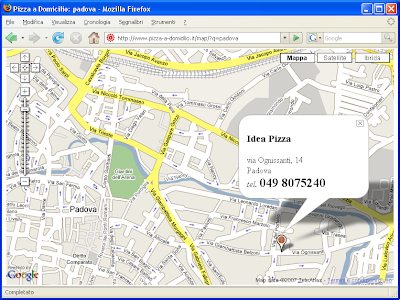 The pizza shops are then retrieved from the server as a XML file and then placed on the map with the following marker: . In order to make the search easier I placed some direct links to the Italian biggest cities: Milano, Torino, Roma e Napoli. I also placed a link to Padova because it's the town in which I placed the most pizza shops.